The CCMS Physician Wellness Program features, among other benefits, confidential, convenient, cost-free access to professional psychological services for all CCMS physician members. From difficulties with the healthcare system and work/life balance, to traumatic events, litigation, and difficult patients or colleagues, whatever the issue, PWP services provide a safe harbor to address normal life difficulties and the challenges of a medical career, receive coaching on managing stress and trauma, and reclaim satisfaction in your career and personal life. CCMS provides up to 6 complimentary sessions with a psychologist per year as a benefit to CCMS members, whether active, retired, adjunct, associate, or resident physician. New applicants will also be eligible; non-members can visit our membership page for information on joining. Confidential appointments are self-referred and physician-initiated with no medical diagnoses, no insurance billing, and no electronic records. No member identification or notification are ever provided to employers, CCMS, or board of medicine. If you utilize these services through the program, your identity is never disclosed to others without your written consent. Participating psychologists bill CCMS directly with de-identified data. *Although CCMS has vetted the contracting therapists for general suitability, basic qualifications, and Florida licensure to provide services, we do not independently verify their credentials nor do we guarantee their suitability for any particular issue for which a CCMS member may seek therapy. Referrals can be made to psychiatric care for more complex medical needs. 1. Call the PWP at 239-208-3984 for an appointment and identify yourself as a CCMS member. 2. Indicate any preferences for psychologist or office location, day of the week, or time of day. 3. Receive same-day response during business hours or next-morning response after hours. 4. See a psychologist within 72 hours to 1 week, possibly sooner for urgent needs, with evening and early morning hours potentially available. 5. If desired, request information on using private entrances or screened arrival and departure. Join a CCMS physician fitness or wellness group, such as running, tennis, discussion, fishing, and more. Email CCMS with your name, preferred contact info, and type of group desired. Take advantage of a fitness center discount — CCMS members are eligible for the Collier County Fitness Centers medical-corporate rate for annual fitness memberships. Rates (incl. tax) are $120.84 per member, additional family members $106 each. Enjoy workout facilities with modern amenities and a variety of classes, including yoga, cycling, Pilates, and spinning. Sign up at any county fitness facility, ask for the Collier County Medical Society medical-corporate rate. For more information visit the fitness centers webpage. Complimentary EAP for practices participating in the Guardian Ancillary Insurance program through Leading Edge Benefit Advisors. Offer your staff and their families an Employee Assistance Program, free for CCMS member practices who offer Guardian insurance products through the CCMS group insurance plans. Contact Timothy McGee at Leading Edge for more information, 239-415-0101. Contact CCMS or any board members with your questions, whether you have a practice management concern, want to explore vendor discounts for CCMS members, or have employment conflicts, we’ll do our best to provide answers or find someone who can. 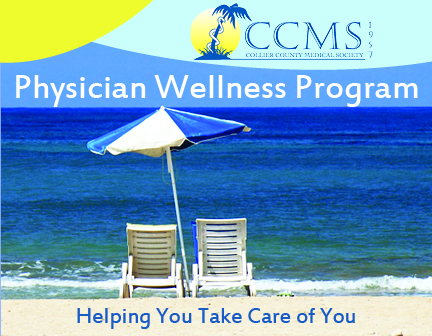 The CCMS Physician Wellness Program was created by Collier County Medical Society in 2017. The Society is building funds to operate this vital program in perpetuity. We invite you to help sustain the PWP and the health and well-being of our physicians, which in turn will help them care for their patients. Thank you to the Foundation of Collier County Medical Society, our 501c3 charitable arm, for helping to support this program. Contact April Donahue, CCMS Executive Director for details.